VPSBlocks Review 2019: Is VPSBlocks a Good Hosting? VPSBlocks offers its customers the opportunity either to configure a solution based on their needs or to have one created for them. With their own Australian data center facilities, and big-name networking partners that provide Tier 1 bandwidth infrastructure, you’ll be assured of superior performance. VPSBlocks is a privately-owned hosting company located in Melbourne, Australia. Since their inception in 2012, their focus has been on providing high-availability, high-performance VPS hosting to the Australian market. By letting customers configure their own servers, or by providing custom solutions, they offer products tailormade for customers’ needs. Their headquarters and data center facilities are located in Melbourne. The biggest advantage that VPSBlocks offers is choice. When configuring your VPS server, you can select from a number of Windows and Linux distributions, a Plesk or cPanel control panel, and the exact resources you want. Although the resource limits aren’t the highest, you can set up a powerful solution with up to 40GB of fully-dedicated RAM. VPS servers also make use of the CloudFlare CDN in conjunction with Tier-1 network infrastructure for better performance around the world. Thanks to this, VPSBlocks performs excellently in terms of high-availability and page load speeds, as can be confirmed by multiple independent testers. With multiple network partners like Telstra, NextGen, and Pipe, they also have a redundant network. All international traffic is routed through the Melbourne distributed denial of service (DDoS) scrubbing center. However, one blotch on the VPSBlocks copybook is that some of their customers have suffered DDoS attacks. Pricing works a bit differently at VPSBlocks. Instead of providing premade VPS packages for you to choose from, you build your own solution and get priced accordingly. You can choose the operating system and control panel combos (with the control panel license included in the price) but your choice of operating system can have quite an effect on the base price. Being able to tailor-make a hosting solution to suit your needs and budget may be nice, but it makes this provider one of the more expensive ones. There aren’t any unlimited options, and for most configurations, you’ll probably find a cheaper host elsewhere. They do offer a 7-day money-back guarantee on VPS products that have a cPanel or Plesk license, and a 15-day money-back guarantee on ones without. Slightly discounted semi-annual and annual billing is offered as well. If you want any advanced services such as private cloud or dedicated virtualized servers, you’ll need to contact the company for a custom quote. 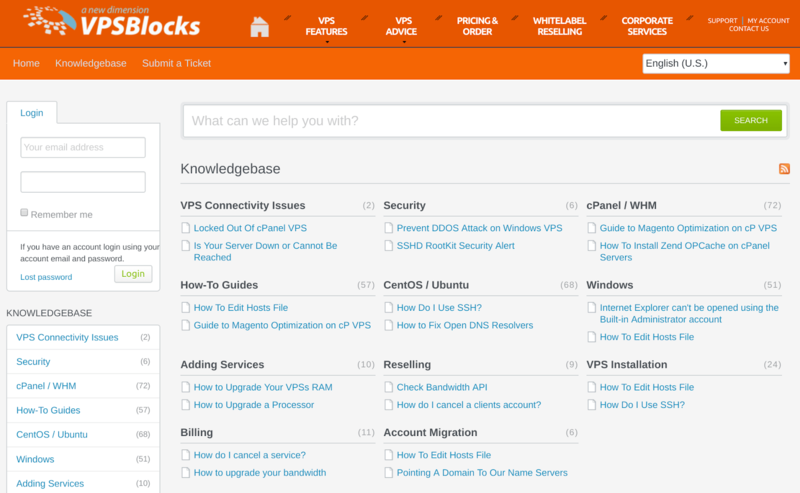 VPSBlocks offers 24/7 technical customer support for all their VPS hosting products. You can contact their Australian support staff via telephone during office hours, or by ticket/email at any time. You usually receive responses to your support queries fairly quickly, but I have seen some complaints online about how customers were treated. If you like to solve your issues yourself, you can find a great knowledge base with a variety of topics on their website. VPSBlocks is a hosting provider for discerning customers who don’t mind paying more for the assurance of high-availability and high speed-to-market within Australia and abroad. Configuring your own VPS is a very useful, but it can get costly. 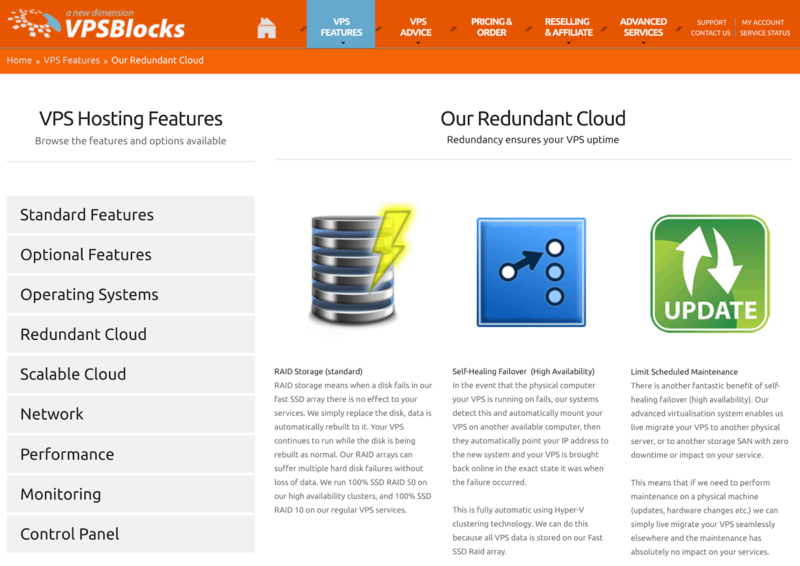 Tailor-make a high-performance and high-availability VPS at VPSBlocks. Wondering how VPSBlocks stacks up against other Web Hosting companies? Enter any other Web Hosting company and we will give you a side-by-side comparison.